All of our eBooks can be read on any Windows, Linux or Macintosh computer. Several eBook file formats are available, each offering their own unique features. The nice thing about reading an eBook on your computer is that e-reader software is available to let you read virtually any file format. You probably have some of these programs already installed on your computer; most other eReader programs are available for free downloading. What eBook file formats can you read on your computer? The following table details the formats available in our store, the unique features of each file format, and what eReader applications are necessary to view each type of file. Because of their widespread availability, PDF and EPUB are the most popular with personal computer users. Many users like the simplicity of PDF eBooks, which exactly reproduce the original printed page and can be viewed with the popular Adobe Reader software (or Adobe Digital Editions for DRM-protected PDFs). Other users prefer the versatility of the EPUB format, which is designed especially for online reading, automatically flows the text from page to page, and lets you easily change the font size for easier viewing. The EPUB format is also compatible with most portable eReaders and other mobile devices. This means that you can download a single file and view that eBook on your computer, your Nook or iPad, and your iPhone or other smartphone. Know, however, that not all eBooks are available in all formats. In our store some titles are available only in PDF, while some are available in both PDF and in EPUB formats. Mobi-format versions of our books are only available from Amazon.com. PDF, which stands for Portable Document Format, is the most universal eBook file format, as it can be viewed on virtually any device. PDF eBooks exactly reproduce the original printed page. They also include hypertext links to other sections of the book or sites on the Web. In many instances, PDF eBooks include a hyperlinked index and table of contents; click on any entry to go directly to that page in the book. If an eBook is available in PDF, you'll see a link similar to the one below in our store. Click the Buy button to purchase the eBook. After completing the purchase process, the file is now available for downloading on your Account page for downloading to your computer's hard drive. Click the link to download the PDF after purchase. To view a PDF file, you must have the Adobe Reader program installed on your computer, which you probably do already. If you need the Adobe Reader program, it's free; just go to http://www.adobe.com/products/reader/ to download and install the latest version of the program. You use the Adobe Reader program to view PDF eBooks. To read an eBook, launch Adobe Reader and select File, Open. When the Open dialog box appears, navigate to and select the eBook file, then click the Open button. The eBook now appears in the Adobe Reader window. To turn to the next page in the eBook, press the Pg Dn button on your computer keyboard. To return to the previous page, press the Pg Up button. You can also advance to the next page by clicking the down arrow on the Adobe Reader toolbar; to return to the previous page, click the up arrow. To search for a given word or phrase, enter that term into the Find box in the Adobe Reader toolbar, then press Enter. The first instance of that term is now displayed and highlighted onscreen. To view the next instance of that term , click the Find Next button in the toolbar. To return to the previous instance click the Find Previous button. In addition, Adobe Reader displays a table of contents in the left sidebar. This may be a listing of the book's chapters, or in some instances sections within chapters. To go directly to a given chapter or section, click that item in the table of contents. To change the size of the eBook page, click the – or + buttons in the Adobe Reader toolbar. Click – to make the page smaller, or + to make it larger. You can also display the page full-width in the Adobe Reader window, by clicking the Page Width button in the toolbar. Or you can display the entire page onscreen by clicking the Full Page button. The EPUB format is gaining popularity, primarily because of its portability. You can download a single EPUB file to your personal computer and then read that book on any number of other devices. The EPUB page isn't exactly like the original printed page, as the document is adapted for the screen. The text automatically flows from page to page, no matter which text size you select. If an eBook is available in EPUB format, you'll see a link similar to the one below. Click the Buy button to purchase the eBook. After completing the purchase process, the file is now available for downloading on your Account page. To view an EPUB file, you must have a compatible eReader program installed on your computer. One of the most popular eReader programs for EPUB books is Adobe Digital Editions. 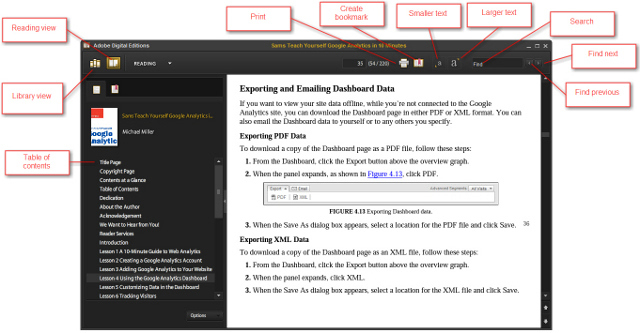 This program can read both EPUB and PDF eBooks. You can download the program for free from http://www.adobe.com/products/digitaleditions/. To read an EPUB eBook with Adobe Digital Editions, that book must first be added to the program's library. Click Library in the toolbar and select Add Item to Library; when the Select Items to Add to Library dialog box appears, navigate to and select the EPUB file, then click the Open button. To open an eBook, click the Library View button in the toolbar then double-click the book in the main window. To turn to the next page in the eBook, press the Pg Dn button on your computer keyboard. To return to the previous page, press the Pg Up button. To search for a given word or phrase, enter that term into the Find box in the toolbar, then press Enter. The first instance of that term is now displayed and highlighted onscreen. To view the next instance of that term, click the Find Next button in the toolbar. To return to the previous instance click the Find Previous button. 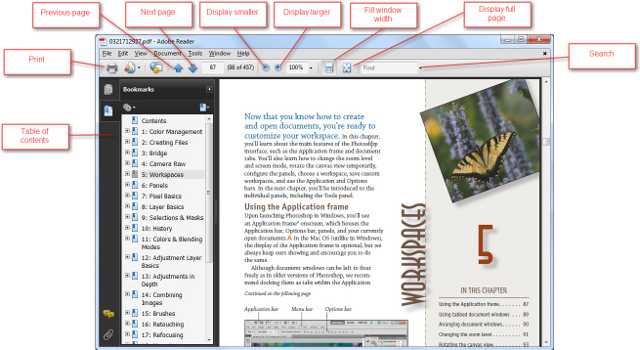 In addition, Adobe Digital Editions displays a table of contents in the left sidebar. This may be a listing of the book's chapters, or in some instances sections within chapters. To go directly to a given chapter or section, click that item in the table of contents. To change the size of the onscreen text, click the Decrease Text Size or Increase Text Size buttons in the toolbar. The pages will be automatically reformatted to adjust to the new text size.